Pedro Carvajal has finished the final edit of his documentary “Popaganda: The Art and Crimes of Ron English”, based on the work of pop artist, billboard liberator Ron English. 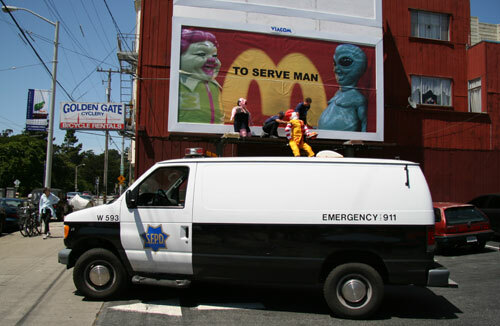 Pedro has added some new scenes based on the “To Serve Man” billboard improvement that Ron English and the Billboard Liberation Front collaborated on in San Francisco back in May, which commemorated McDonaldâ€™s 50th Anniversary. Earlier today, the BLF’s own Jack Napier described, in detail, the logistics of this hit on the BLF’s recently launched blog. This new version of “Popaganda” will be screening at San Francisco’s Red Vic Movie House from September 23rd through 29th. Here’s the full schedule. There will be a special Q & A with Jack Napier & Milton Rand Kalman of the BLF after the Friday, September 23rd 9:15pm show and with Jack Napier after the Saturday, September 24th 7:15pm show.